The strange looking vehicle from Batman Begins is really eight cars. Four of them are truly fast. 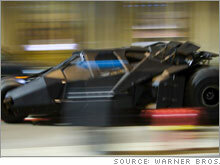 NEW YORK (CNN/Money) - If the crouching, jagged Batmobile from the movie "Batman Begins" looks to you like the offspring of a Lamborghini Countach and a Hummer, congratulations. You hit the nail on the head. When production designer Nathan Crowley was trying to conceive the car's look, he went to a hobby shop and bought 1:12 scale models of a Lamborghini Countach and a Hummer. Crowley cut those two models apart and combined them, dropping in the cockpit from a model of a P-38 Lightning. "It looked awful," Crowley said. But it was a start, and it was headed in the right direction. The concept went through several revisions before Crowley and his colleagues were satisfied that they had found the new Batmobile. After creating each model, Crowley would photograph it. Then he used graphics software to superimpose the Batmobile's image onto photographs of New York City street scenes. Those were the closest things he could get to Gotham City at that time. "Batman Begins" was produced by Warner Bros., which is part of Time Warner, as is CNN.com. When he finally had a finished model, Crowley took it to car builders at England's Shepperton Studios where Chris Cobould and Andy Smith led a team that constructed the actual cars used in the film. "They did a fantastic job," Crowley said. He felt strongly, he said, that there had to be no compromises on the car's appearance. The finished Batmobile had to look just like the model or it wouldn't be right. Crowley also didn't want to use any digital effects in scenes involving the car. Even the best computerized visual effects wouldn't have the gritty, realistic look he wanted, he said. That meant the car had to be fast and be fairly maneuverable. Initially, it was thought that the hardest part of building the real car would be the front axle. Or, rather, the lack of a front axle. But its builders were able to create a strong enough front suspension based on two huge articulated arms, just like the model. Under full acceleration, the car would actually rise up on its front "legs" while the front wheels stayed planted on the ground creating an effect like a giant spider -- a "bonus," according to Crowley. The hardest things to get right were the tires. It took the filmmakers three months of searching to find the off-road truck tires they used for the rear wheels and the wide racing tires used on the front. The four fully driveable Batmobiles the crew built are powered by a 340-horsepower General Motors V8 engine. Despite its tank-like appearance, the car is capable of going from zero to sixty miles an hour in 5.3 seconds, said Crowley. The "jet engine" on the back of the car was fed by propane tanks. There were four other Batmobiles created for the movie, as well. Two, used for scenes in which someone got into or out of the car, were powered only by electric motors. The space normally occupied by the engine was taken up, instead, by the hydraulic machinery used for the complex opening roof. Two more Batmobiles, empty rolling shells, were shot out of huge air cannons to create leaping shots like those in which the car jumps through a waterfall into the Bat Cave. A miniature car was used for a few scenes that couldn't be safely filmed using a full-sized vehicle. Chase scenes through the streets and highways of Gotham City were filmed in Chicago. Although Gotham was modeled on New York -- Crowley called Bruce Wayne's hometown "New York City on steroids" -- Chicago agreed to shut off 12 blocks of the city for "Batman Begins" chase scenes. Stunt driver George Cottle trained for months, Crowley said, taking the Batmobile for laps on a closed race track. Visibility from inside the cockpit was extremely poor, said Crowley, limited to a small area directly in front of the car. Video cameras wired to screens inside the cockpit provided views to the sides and back of the car. For all of its capabilities, one thing the real-life Batmobile did not have was air conditioning. "You lose a lot of weight driving that car," Crowley said.